"This is a variation of a snack mix. I have had so many requests for this from our school's soccer team, that it has now become our soccer snack mix. Sometimes I add a few extra bagel chips once the mix is done cooking because that is our favorite part." Mix butter, Worcestershire sauce, seasoned salt, garlic powder, and onion powder in a bowl. Combine rice cereal squares, corn cereal squares, wheat cereal squares, pretzels, goldfish crackers, bagel chips, and peanuts in a bowl. Mix about 1/4 the cereal mixture with 1/4 the butter mixture in a separate bowl until coated; continue adding more cereal mixture and more butter mixture until cereal mixture is fully coated in butter mixture. Pour onto a baking sheet. Bake in the preheated oven, stirring every 15 minutes, until butter mixture is baked into cereal mixture, about 1 hour. Delicious! I added cheerios and used 8 tablespoons of butter. Will make again. 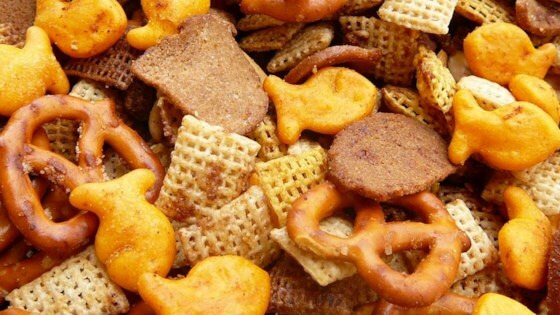 We never tried anything but original Chex Mix. This was a new twist for us. We did put a 1/2 cup of sunflower seeds into it. OH my goodness everyone just LOVES this. I made as is, no changes made to the recipe, and it was delicious! Everyone at work and home loved it. I will be making this again! Six minutes in the microwave works well too. Stir three times. It was reminiscent of the good old chex mix from my past. I doubled the seasoning because I like a bold taste, decreasing the salt a bit so as not to be too heavily salted. Got rave reviews! No garlic bagel chips in my market so added cheetos. Very good. Delicious and I always have some on hand to munch. So much better than store bought. It's great with Life or Cracklin' Oat Bran cereal too....adds a bit of sweetness.